Psyche – Everything is Oll Korrect! 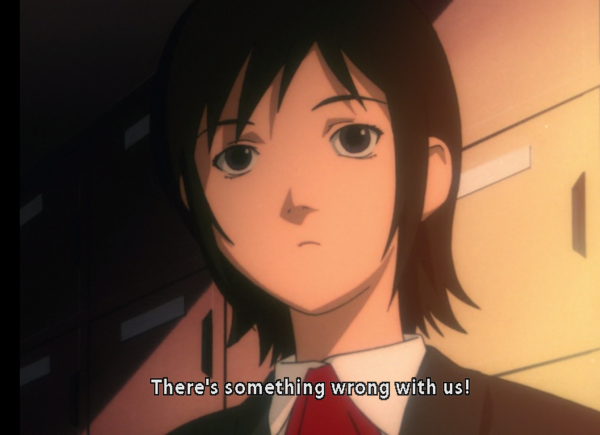 Ready for more serial experiments lain? 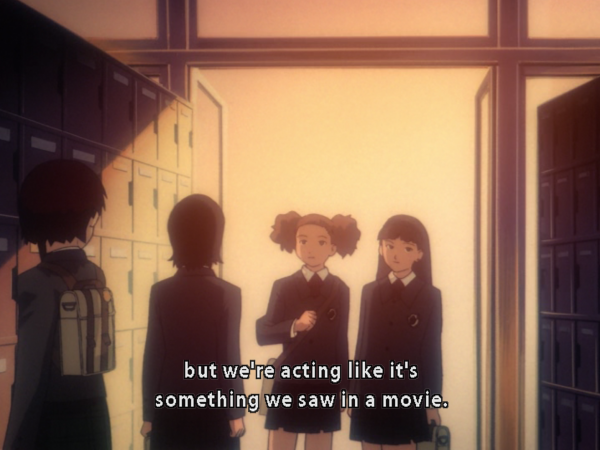 In Layer 03: Psyche the beginning voice-over tells us “There’s a girl named Lain. You may have heard of her. 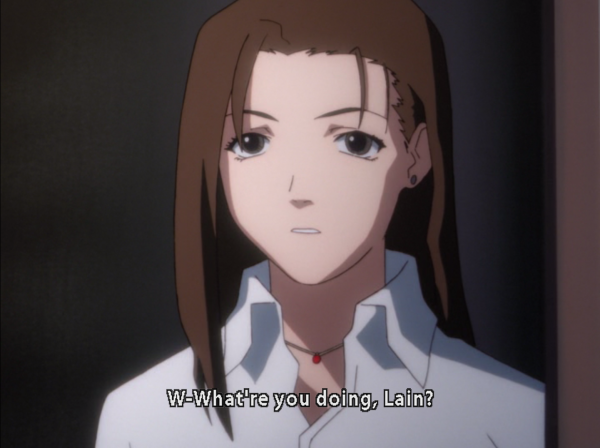 She’s on the Wired.” The episode proper begins at a police station, where an officer is questioning Lain about the incident at Cyberia. He tells her that no one at her house has answered the phone, and sh isn’t sure why. When she does get home, no one is there and it seems almost too neat, like a hotel room. Alice apologises to Lain, and the next day at school the girls are talking oddly lightly about what had happened, which Alice later points out as rather strange, considering that a man killed himself right in front of them. 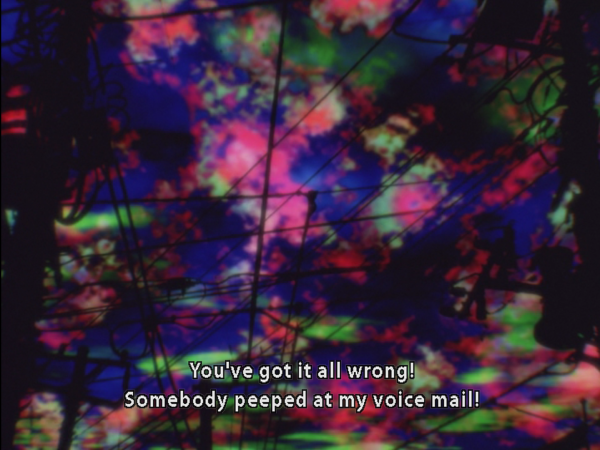 This line of conversation is interrupted when Alice notices that Lain received an envelope in her locker, which turns out to be a computer processor. 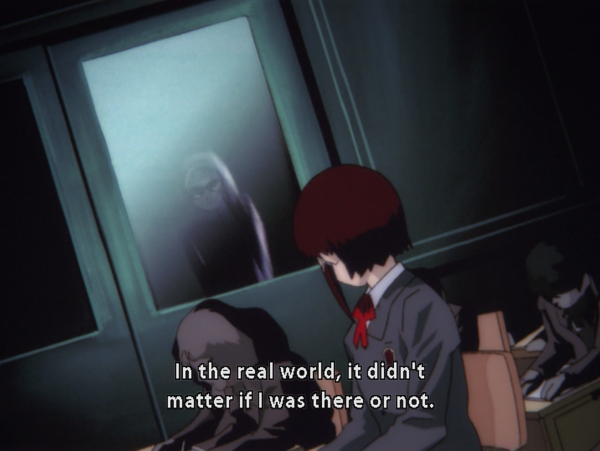 Lain asks her father what it is, and he (not quite believably) claims he doesn’t know, so she returns to Cyberia to ask Taro and his friends, who she’d briefly encountered in the previous episode. Taro, player that he is, says as payment for this information he wants a date with the “wild” version of Lain. That night, Mika encounters the Men in Black at the front door of their home; she tells her mother who, as usual, is unconcerned. Mika goes upstairs and finds Lain installing the Psyche processor, mostly undressed. Let’s start with a few quick observations. One is that the bear pyjamas are off. Lain returned to the Cyberian underworld fully voluntarily, and from now on will be fully invested in the Wired. 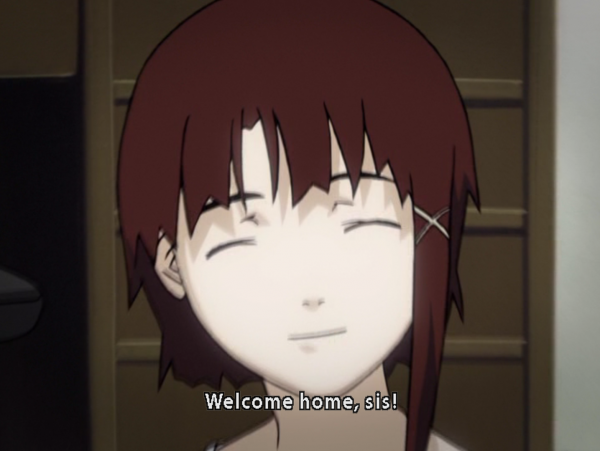 Note, for instance, how the personality of Lain of the Wired (the “wild” Lain) manifests herself twice, when she scowls at Taro’s suggestion of a date and when she gives that huge smile to Mika. In addition, we’re given a batch of voice-overs sharing rumours and such from the Wired, spoken over abstract colours and scenery. These vary wildly in kind, from a desperate “You got it all wrong! Somebody peeped at my voicemail!” to the businesslike “As the relevant clauses were not in the résumé we received we are currently discussing how to handle it. As for your company…” There’s also some discussion of the state of the drug trade for Accela after the Cyberia shooting, speculation on who the Knights are, someone exclaiming how good dying feels, a report of a “kid” in a striped sweater watching someone in her room, and some woman talking about how much she loves kissing. There’s no filter on what any of these people are talking about, and it’s not clear how much is even intended to be public. I could easily see much of this on Twitter or various imageboards; the corporate one likely should’ve been private, but was leaked. These segments generally don’t contribute directly to the story, aside from foreshadowing a few things like the Knights and the kid in the sweater, but make the Wired feel like a global stream-of-consciousness of the collective unconscious. The “Dying feels so good!” stood out to me since it’s not clear if this is from someone who’s just crazy, a joke, or someone who actually did kill herself, though it is likely someone like Chisa. The characters of the rest of the Iwakuras also come to the fore in this episode. Mika seems like the most normal, in that she teases Lain like an older sibling, but also seems to be the only one concerned with Lain’s changing behaviour and with the Men in Black. Mrs. Iwakura is oddly detached from everything. She has nothing to say about the MIBs hanging out in front of the house, and in the morning after the Cyberia shooting also has nothing to say to Lain except for a mild scolding for having slept in late. We have seen quite a bit of Mr. Iwakura already. So far he’s been, well, not quite a mentor character, but has been the one to gently guide her into the world of the Wired, and for the most part has been the warmest toward Lain. Here, though, he clearly knows what the Psyche processor is, but holds back and from here on out he becomes increasingly detached from Lain. 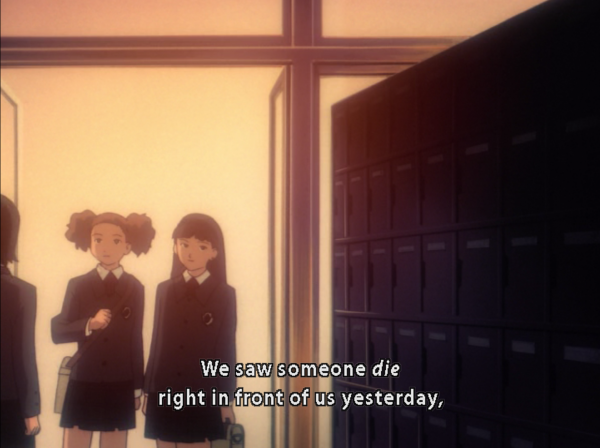 Within a few episodes, Lain will have essentially no human contact with her family, and Alice will remain her only anchor to the real world. 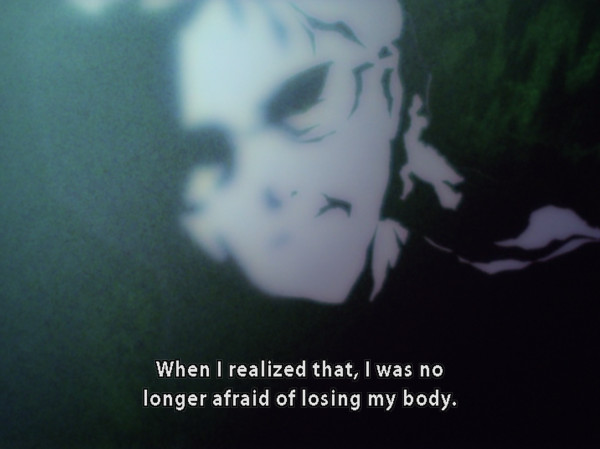 That said, some connection will remain – he is, after all, the one that Lain sees in vision at the end of the series.